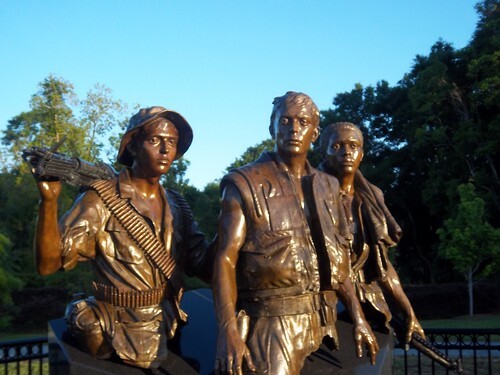 We traveled to Apalachicola, Florida, where we visited a striking replica of one of the Vietnam Memorial sculptures in D.C. It was a depiction of three soldiers in the field and definitely conveys some of the intensity of war… This week we also talked to Gladys Quattlebaum in Lanark Village, Florida. Her husband fought in Vietnam. He died later of complications from exposure to “agent orange.” (He also had PTSD.) For 12 years, Mrs. Quattlebaum regularly wrote to sitting U.S. presidents protesting what she saw as a lot of the folly of war. She never got a response. This day in Lanark Village, I felt like I was making up for the no responses a bit, as I listened. Note: Up the road on Rte. 98 along the coast, we visited a beach that was the D-Day Training Site during World War II. In 1943, members of the 4th Army Division trained in the surf and dunes here in preparation for the famous “Invasion of Normandy” that would take thousands of American soldiers’ lives on June 6, 1944.